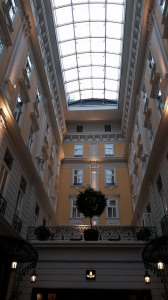 Last week, the Apache Software Foundation, with the help of the Linux Foundation event team, hosted ApacheCon Europe in lovely Budapest, Hungary at the gorgeous Corinthia hotel. 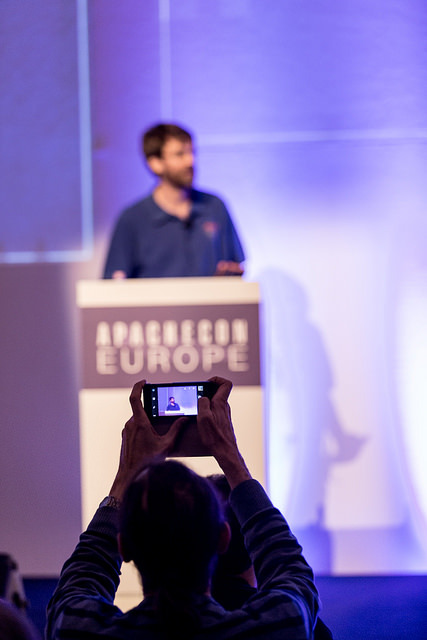 If my count is right, this was the 24th event to bear the name ‘ApacheCon’, and the 8th time we’ve done it in Europe. 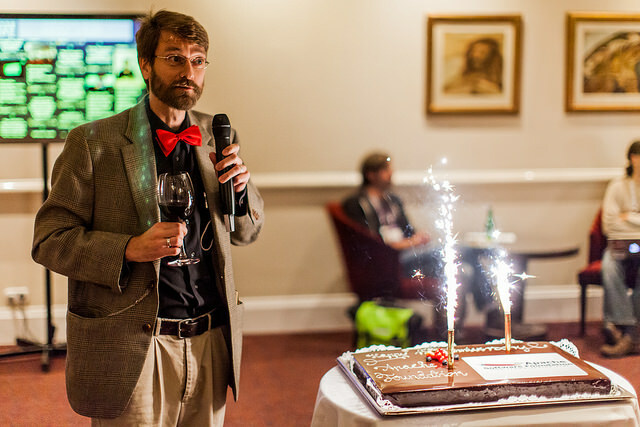 Also, we were celebrating the 15th anniversary of the Apache Software Foundation, which incorporated in June of 1999. Every ApacheCon has its own set of memories, from Douglas Adams pacing the stage in London, to the ApacheCon Jam Sessions in Dublin, to the Segway tours in San Diego, to the funeral march in New Orleans. And Budapest was no different – a wonderful event with lots of great memories. On Sunday night, I had dinner with the TAC’ers. The Apache Travel Assistance Committee is a program by which we get people to ApacheCon who could otherwise not afford to be there. This is critical to the mission of the ASF, because it builds the community in an inclusive way, rather than limiting it to people with the funds to travel. TAC recipients have to give back a little – they provide session chair services, introducing speaker and counting attendees. A large percentage of our former TAC recipients have become deeply involved in the ASF, more than paying off the investment we make in them. 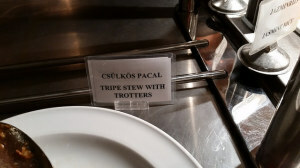 Although I didn’t try the Tripe And Trotters on the buffet line, I did enjoy great conversation with old friends and new ones around the table. Monday morning, I opened the conference with the State Of The Feather keynote – our annual report on what the ASF has done with sponsor dollars and volunteer time over the last year, and some thoughts about where we’re going in the next 15 years. The latter is, of course, very difficult in an organization like the ASF, where projects, not the Foundation leadership, make all of the technical decisions. However, David Nalley, the VP of Infrastructure, had some pretty specific ideas of what we have to do in terms of Infrastructure investment to ensure that we’re still able to support those projects, which are being added at about 1.5 a month, for the next 15 years and beyond. 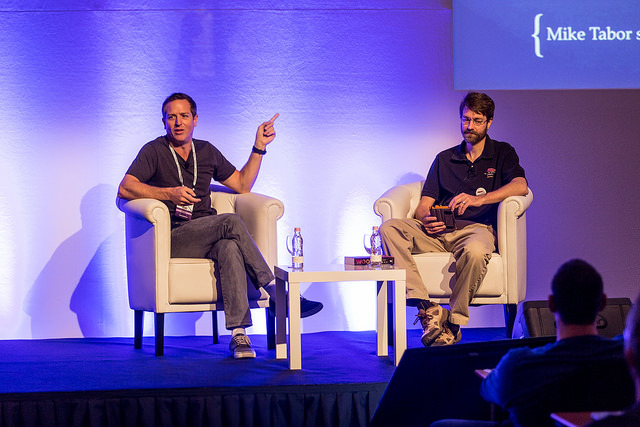 After the State of the Feather, I had the enormous privilege to stay on the stage with Hugh Howey to discuss the parallels between self publishing and open source software development. I’ve got another blog post in the works specifically about that, so stay tuned, and I’ll add a link here when it’s ready. Any day that starts with me hanging out on stage with a favorite author in front of 300 of my closest friend is a good day. Once the sessions started, everyone went their separate ways, and I gave several talks about the Apache httpd project. httpd has been my main focus at Apache for 15 years, and although it’s faded into the background behind more exciting projects like Spark, Hadoop, CloudStack, Solr, and so on, it’s still the workhorse that powers more than half of the websites you’ll ever see, so there’s always a decent audience that turns out to these talks, which is very gratifying. 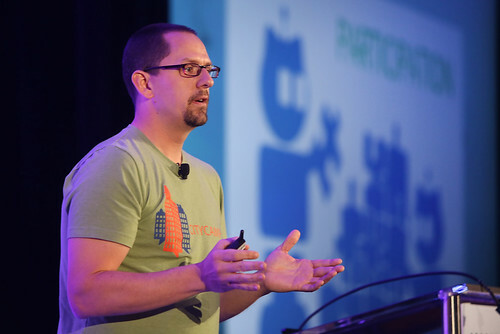 One of my talks was more focused on the business of doing documentation and “customer support” in the open source world. My “RTFM? Write a better FM!” talk discusses the RTFM attitude that exists in so many open source software communities, and how destructive it to the long term health of the projects. I’ve got another blog post in the works specifically about that, too, and I’ll add a link here when it’s ready. Tuesday and Wednesday were a whirlwind of sessions, meetings – both formal and informal, and meals with friends, colleagues, and newly-met conference attendees. As a board member, I’d sometimes get pulled into project community discussions to offer the board’s perspective on things. As conference chair, there we numerous discussions about the upcoming event – Austin, Texas, April 13-17 – and the next Europe event – stay tuned, announcement coming soon! 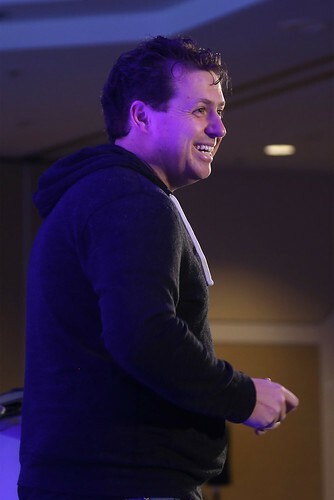 Shane Curcuru’s talks on trademarks, copyrights, and protecting the Apache brand. 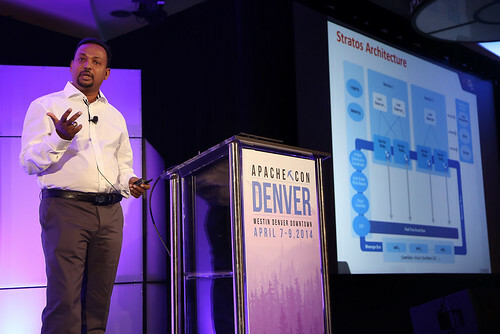 Jesus Barahona’s talk about the statistical analysis work he’s done for Cloudstack, and other projects, and how it can be used to support and encourage community growth. Pierre Smits’ case study talk about OFBiz and beer, which I missed because I was speaking at the time, but which I heard was amazing. Joe Brockmeier’s talk about Docker, which was apparently the best-attended talk of the entire event. 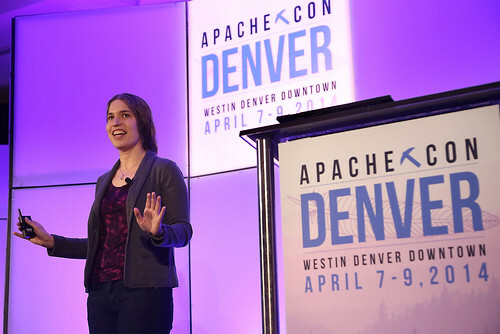 Although we didn’t record the talks this year (if you’re interested in sponsoring that for next time, get in touch – rbowen@apache.org), you can see the slides for most of these talks on the conference website. 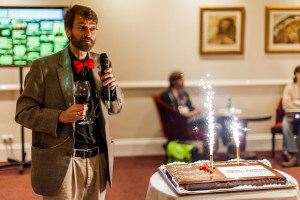 On Monday night we had a birthday cake for the ASF, and I got all emotional about it. The ASF has been hugely influential in so many aspects of my life, from my amazing friends to my amazing job, and it’s such an honor to serve the Foundation in the capacity of conference chair. I look forward to the next 15 years and seeing where we go. And then, so fast, it was Wednesday evening. 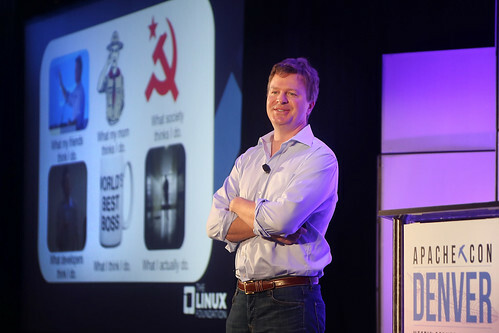 David Nalley gave his keynote about the value of the Apache Software Foundation. While I was expecting a number – something like 3 trillion dollars or something – instead, he talked about the many ways that the ASF adds value to companies, to individuals, and to the world as a whole. A truly inspiring talk, and it made me incredibly proud to be associated with the ASF. Bror Salmelin then talked about the Open Innovation 2.0 project at the European Commission to close out the formal portion of our event. The lightning talks were a big hit this time around, with a great mix of serious and lighthearted talks, all in five minutes or less, MC’ed by the inimitable Joe Brockmeier. On the whole, I was very pleased with this conference. If there’s anything that disappointed me about the conference, it’s only the number of old friends who couldn’t make it. 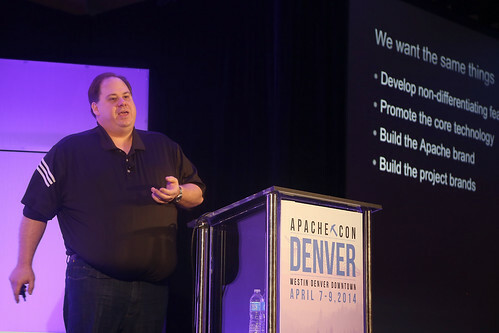 I hope that everyone who couldn’t make it to Budapest is able to come to Austin to celebrate the 25th ApacheCon, and the 20th anniversary of the first release of the Apache HTTP Server!